Did you know our Mysteries Travel? Will come to a venue of your choice! Give your patrons and your guests a show that will keep them laughing throughout the night — and then, coming back for more! The Adams Mystery Players on Tour is the answer for your unique and interactive offerings. The Players are able to transform almost any site into a setting of comical murder, and, if need be, can travel with different scripts and show titles. Your guests will thrill as they solve the crime with this cast of spontaneous characters. Your troupe of mystery performers are professional, rated PG and definitely PC. You will find them to be easy to work with and able to entertain crowds 8 to 80 years old. 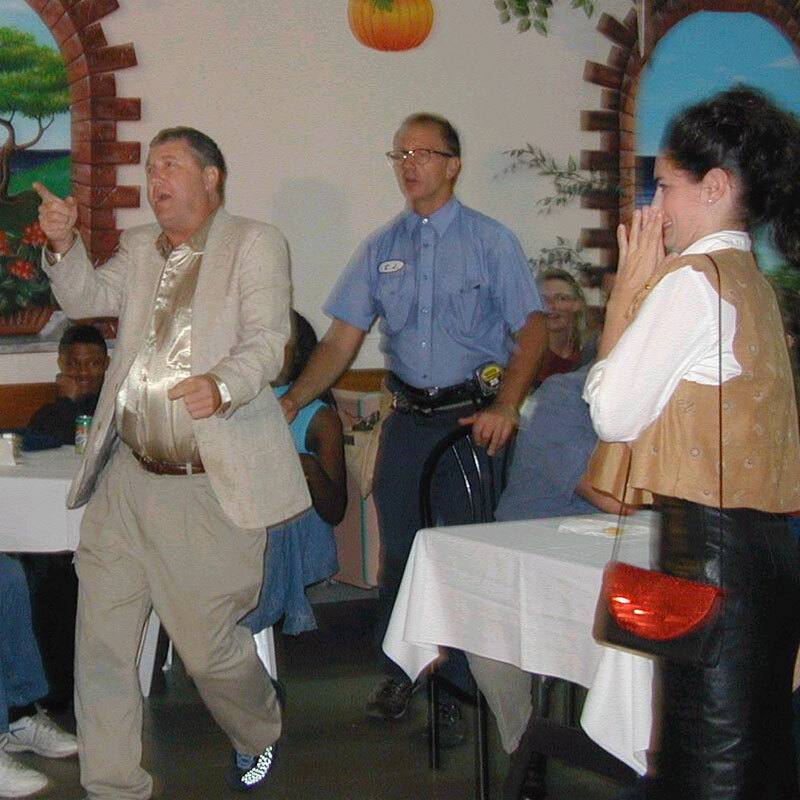 A banquet room is ideal for mystery dinner theatre shows; however situations where a meal is not served are lots of fun, as well. Since 1985, the performers involved in Adams Mystery Players have performed for: over twenty tours for the US Department of Defense military bases overseas; the Half Moon Resort in Jamaica for Storage Tech; corporate team building in Las Vegas; ski areas in Colorado, including Vail, Breckenridge, Keystone, Aspen and Winter Park; the Broadmoor Hotel; the Stanley Hotel, Estes Park; Kansas, Nebraska, New Mexico, Wyoming, Pennsylvania and New York. Overseas tours included South Korea, Japan, Okinawa, Hawaii, the Marshall Islands, Diego Garcia, Spain, Italy, Germany, Greece, Iceland, Greenland and England. Call (303) 462-3400 today for your tour dates, sound and lighting requirements and shows available. Catering to both the public and private sector for over 20-years, our Mysteries are the ideal entertainment choice for any type of gathering or event. In addition, our laugh-packed shows are designed to involve everyone in your group, from the moment they walk through the door, to create an experience chock-full of intrigue and fun! Book your own Private Interactive Mystery for your next group gathering or corporate event where we come to your location. One of the many outstanding features of our Interactive Comedy Mysteries is the flexibility to customize the evening to you. We take specific details (names, jobs, slogans, etc.) about your company or group and intersperse them into the script to fulfill your expectations for maximum hilarity. The emphasis is on fun and humor; our special brand of comedy is appropriate for all ages and any type of group, venue or corporation. Everything is Politically Correct! In addition, our mysteries are designed for adaptability and the perfect entertainment for groups of any size. With no set and minimal props, our cast of five actors travel to your dinner, OR we can coordinate the entire dinner & mystery package for you at our locations. Death For Dinner can come to your venue with a Mystery for the Public or for a Private Event. Contact our Touring Company about setting up a Mystery night of your own! Call (303) 462-3400 or Email Us!